In a sentence: Peace and quiet. No really, what do I get? Look at these chairs, lovely aren’t they. The standard Japan Rail Pass is quite a ride, but a Green Car Pass is something else. 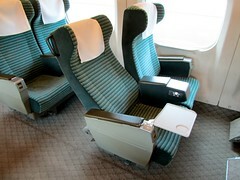 You get huge, 40° reclining, lazy-boy style seats, with so much leg room it’s a cinch to drift off into a deep snooze. You won’t have to jostle for seats at busy times as the Green Car is always uncrowded and quiet. Your personal crew even hand you oshibori wet towels and snacks, such as ice-cream on the Kyushu service! The Green Car is a luxurious experience, but it’s also great for those travelling with families or in peak season. With its unused luggage room and empty seats the First Class tranquility creates a much less stressful travelling environment.